Using a Meta Trader 4 with Bridge, several reasons beyond control of the broker and the licensee of the Bridge you use, may cause a position to be opened or closed in MT4 without the same thing actually happening in the Market. Such situation is called a "position mismatch". 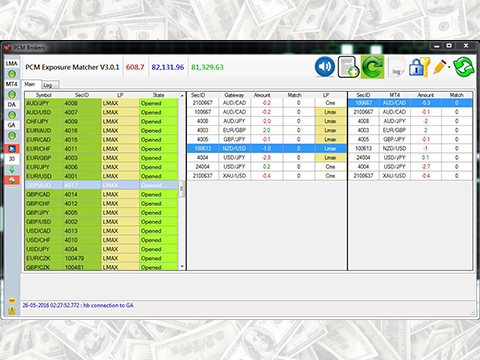 This MT4 plugin checks the open positions in your MT4 from one side and the market(s) from other side on a regular basis (you can define the frequency) and informs your operations team in case of a mismatch. Your operations team then can immediately find the mismatch and take necessary action. This program has the capability to take that action automatically once you defined it for and we can include this feature for a small additional cost.